Are you looking to extend the range of your current WiFi network? 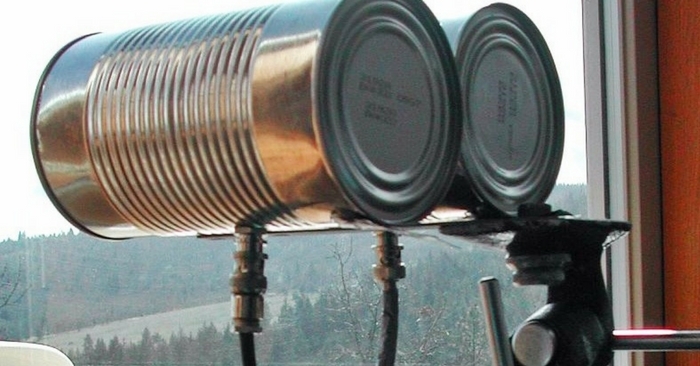 You can build your own DIY wifi antenna out of a tin can. And it will only cost you $5! It’s easier than you think and can be a serious game changer in times of disaster. This is perfect if you’ve been experiencing home WiFi issues. Instead of going out to buy a new internet modem, why not try out this easy DIY project first? Are you ready to learn how to make your own homemade long range WiFi antenna? This DIY build could also be great for post-disaster communications when WiFi signals are limited. The more range you have the better you are going to be able to use your technology. Your tech is a force multiplier in disaster. There are a number of reasons why this might be beneficial to you. It could be that your daily living situation and your location puts you in a place where the WiFi signal is less than optimal. Maybe you don’t have internet at the moment and want to use your neighbors’ WiFi but can’t seem to get a good signal. It might also be something that may help during a power outage. If you know how to make a WiFi antenna to get free internet, this is also useful. 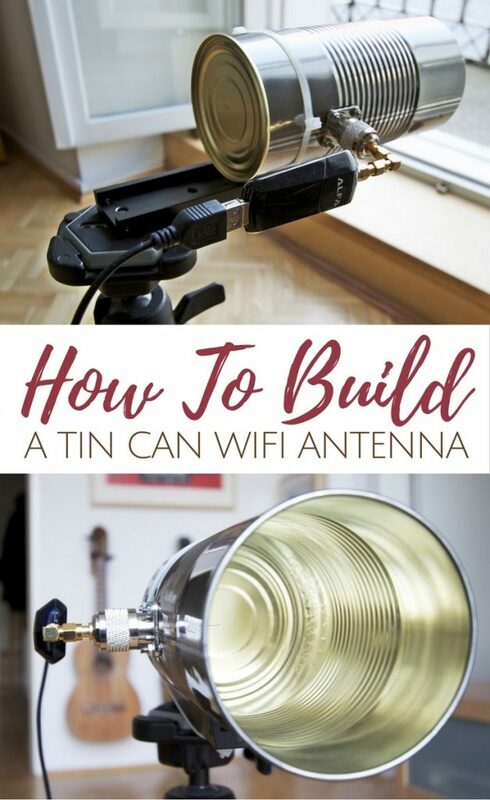 As you can see, there are a number of reasons to try out this DIY WiFi antenna, or a cantenna, also known as a tin can WiFi antenna. This is so frugal it may just put Belkin out of business if we all made one of these bad boys! Use an old tin can from dinner and have the range you need for less than a meal at McDonald’s. This really is a simple DIY project that we all can do any time of the year to get the most of our modems at home. Understanding antennas is a very helpful skill. You know, antennas affect many things outside of WiFi signals. You can even make an HDTV antenna that can get you FREE TV! Although this DIY project involves creating a WiFi antenna, it’s important to point out that understanding antennas is a very helpful skill. You know, antennas affect many things outside of WiFi signals. Did you know you can even make an HDTV antenna? An antenna for HDTV might not be something you need during a survival situation, but it could be some fun until then. Every skill you learn right now will make you a better prepper and a better survivor. A tin can DIY WiFi antenna improves your WiFi range so much that the modem companies tried to hide this little hack for years. The first step is drilling holes into the tin can. Sounds easy enough, right? It is, but it’s a little bit more methodic than you’re thinking. The N-connector needs to be mounted in the side of your can. To do this, you need to drill holes in the right location to place the connector in the right spot on the can. This involves finding the right formula. You can calculate your measurements using the chart at this link. The ¼ guide wavelength number determines how far up from the bottom, or metal, end of the can you should put the center of the hole. Using a ruler, you’ll measure up from the metal end and use the permanent marker to mark the spot. When you use the drill to form the hole, you’ll want to choose a bit that matches the size of the connector. It’s ideal to start using a smaller bit to make the hole larger. An alternative option is using a hammer and a nail for a small hole, followed by drill bits. If you don’t have a drill, that’s okay. You can start out with a nail hole and then use a file to get the hole as big as it needs to be. If the connector needs to be bolted on, you’ll need to make four more holes for the bolts. You can use the connector as a guide for where to drill the holes. Next, you’ll use the soldering iron to cut the copper wire. You’ll need to cut the wire so that the total length of the brass tube and wire stick out 1.21” past the N-connector. You’ll want to get as close to this length as possible. When you have the wire at the right size, you can solder it into the N-connector. You’ll want to keep the copper wire as straight and upright as possible. Once the copper wire has cooled, you will secure the assembly into your can using bolts or screws. You will want to put the bolt heads inside the can and the nuts outside the can in order to reduce obstructions in your antenna. The next step is to connect the antenna you’ve just made to your wireless card or access point. You’ll do this using a special cable that’s commonly known as a “Pig Tail.” The cable will connect the wireless card or access point to your antenna. The cable has an end known as the “N” Male connector. The other end has a connector that works with your wireless card or access point. You’ll want an access point that has an external antenna connector or a wireless NIC. Finally, you’ll want to hook up your cable. Point the antenna at one of your neighbor’s houses and see how far you can get your network to reach. It’s worth noting that the WiFi antenna has what’s known as “linear polarization.” This means that the strength of your WiFi signal will be affected by how you rotate the antenna. The connection will generally work best when it’s straight down, but be sure to experiment with your can to see how it affects your WiFi reach. If you’ve followed this guide, chances are you’ve probably greatly improved your WiFi reach. This is such an easy, effective life hack. If you’ve tried out this DIY WiFi antenna, how did it work? Did you find that it greatly expanded your reach? What measurements turned out to be successful for you?